I spent some time working with the simple color combinations we talk about and use all the time. I try to cover these in every beginning class I teach and then keep tossing out reminders in the advanced classes. Sometimes, our paintings just aren’t what they could be. We confuse our viewers with too much color or don’t provide enough contrast with our colors. We know we can paint anything! any color we choose! We can create a pink horse, a green person, and change the grass to black and the sky to purple if we want! But we do need to be mindful of our viewer if we want our work to have contrast and read well for a viewer. 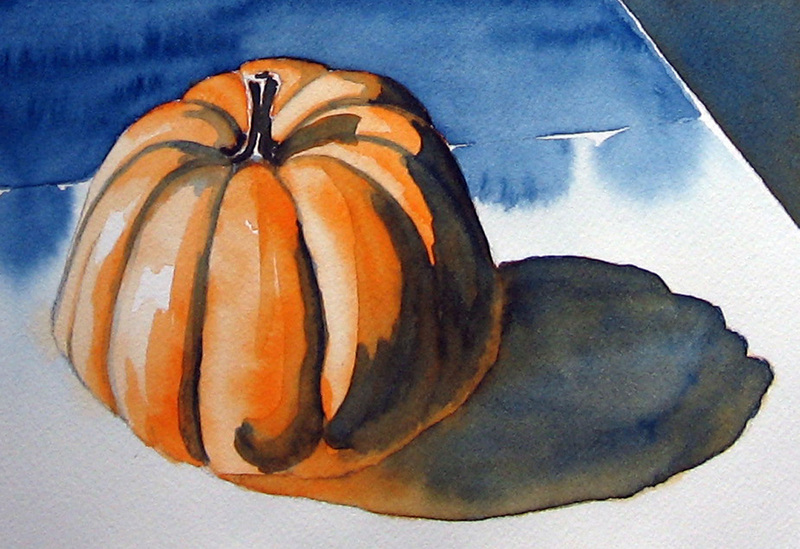 I sat down with 6 x 9 inch pieces of 140 lb Arches watercolor paper and practiced painting this pumpkin in the five color combinations I talk about in classes. The first combination is monochromatic. 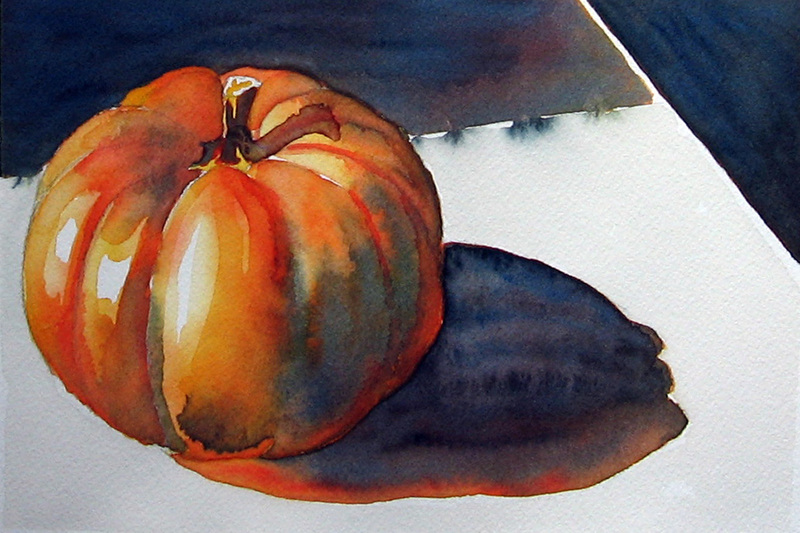 That means taking one color and rendering your entire painting in that color or variations of that color. I chose paynes grey for this one. There could be many versions of a monochromatic. It all depends on how much of the painting you decide to leave white and how much you make your darkest darks and how much midtone values you include. I will save that exercise for another day. The above example is an analagous color scheme of orange and yellow. Analagous paintings are those that have colors next to each other on the color wheel and one of the colors is usually dominant. I believe the orange is the dominant in this and could have stretched my color range to include red, but opted for a neutral of burnt umber instead. 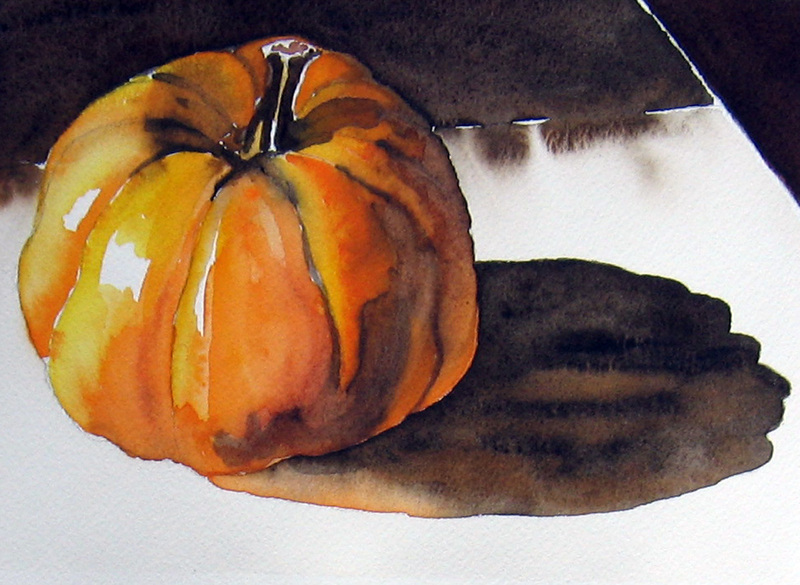 This one stretched my value skills because I chose to paint more of the pumpkin than in the monochromatic example. I had to use varying amounts of water to get the value transitions in yellow and orange. Complimentary colors are those found opposite each other on the color wheel. Mixed together, they can cancel each other out to appear black. Next to each other and they enhance contrast. 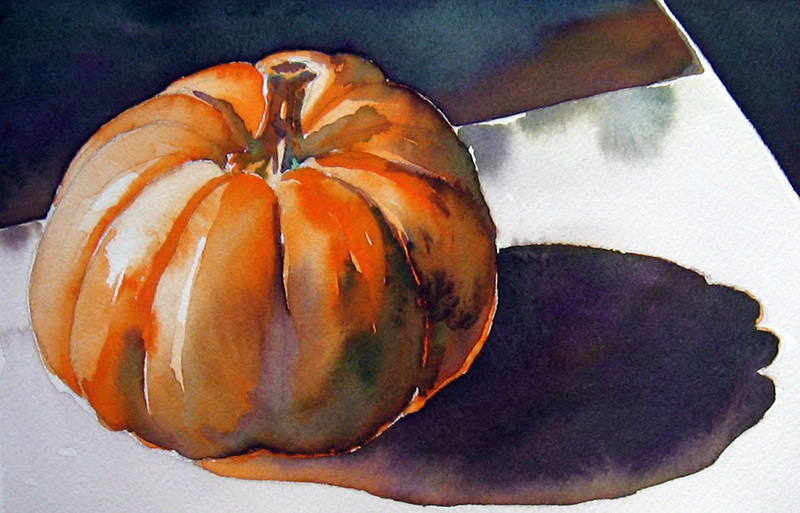 I used no other colors than one orange and one blue to create the pumpkin above. Had I chosen to paint an apple, I’d choose red and green. Had I chosen to paint a lemon, I’d choose yellow and purple. This is where it gets fun! I could use three colors! The secondary triad is composed of the secondary colors orange, green and violet on the color wheel. I liked this one, because it looks the most believable for the subject of a pumpkin. I liked how these three colors produced varying shades for all the shadows in this. I found this painting more soft and relaxing, in appearance, when compared to the next one I tried. The last color combination I tried was the primary color triad of red, yellow and blue. Wow! This one became so vibrant because I could use bright yellow and red to create my oranges and even the blue came through as vibrant on this one. I would call this my festive pumpkin. There seems to be more energy in a primary color painting. Try this one with a simple reference and see what you come up with. These are the only color combinations I teach. It does not mean I stick with only those colors. I add other colors to my paintings. BUT, if I squint at them and there is not a distinct look of one of the above color combinations in them, I go back in develop the painting more until there is. 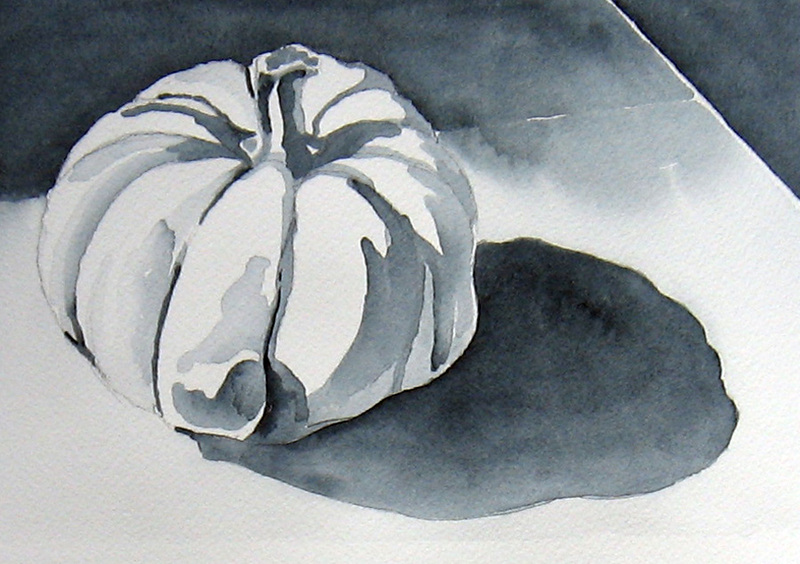 Thank you to wet canvas for the image of the pumpkin I used for my reference. 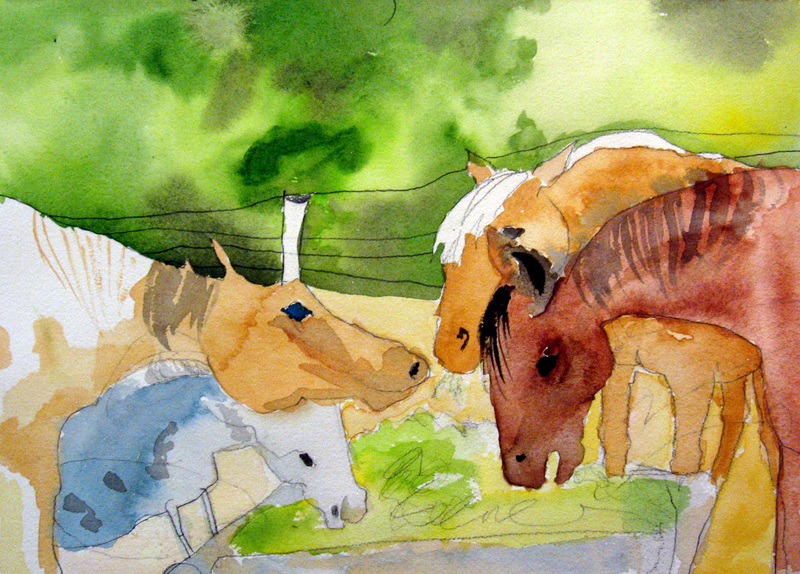 The above paintings were painted by my three Granddaughters this past weekend. 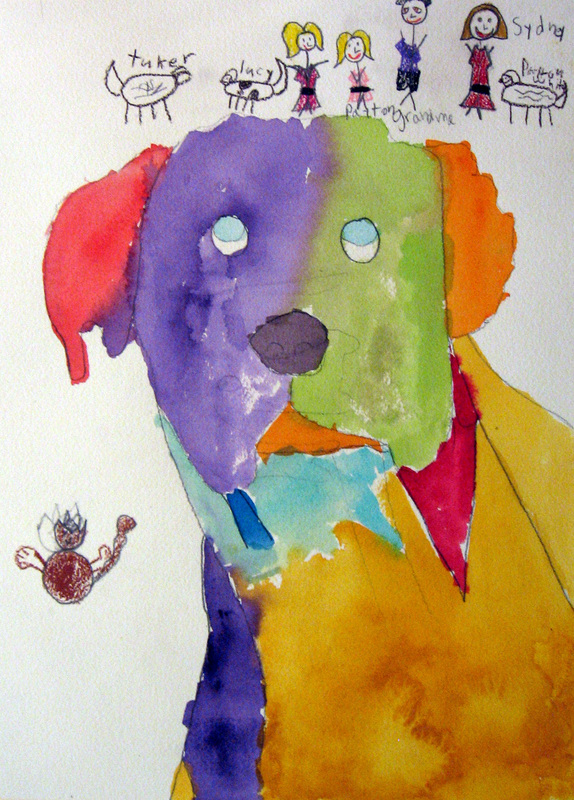 Yes, I have created watercolors and drawings with them since they were little. Their Mothers have also encouraged them with their art. One thing I did not do, however, was purchase less expensive paints, brushes and paper for them to use. I find many of the student grade papers and paints uninspiring, often resulting in dull colors, brush hairs falling out into paintings and paper that tears or won’t hold up to multiple glazes or layers. All three of them begged me to be able to paint and helped me to tape their paper to the board. The oldest ran for my pile of photo references. They used to select pictures from their coloring books that were easier to draw but would have none of that this time. The 6 chose a portrait of Abner, my daughter’s dog, the 7 chose a photo of my daughters three horses and mini donkey, and the 8 chose a photo of a polar bear! I said, “Are you sure you can do these?” The 8 said, “Yes. We can draw them by feeling the edges of the lines while we draw!” They have all practiced drawing with a continuous line, before. I helped a little, but not a lot! Mostly just to point out an angle of a line or a bump on a horse knee or jaw. 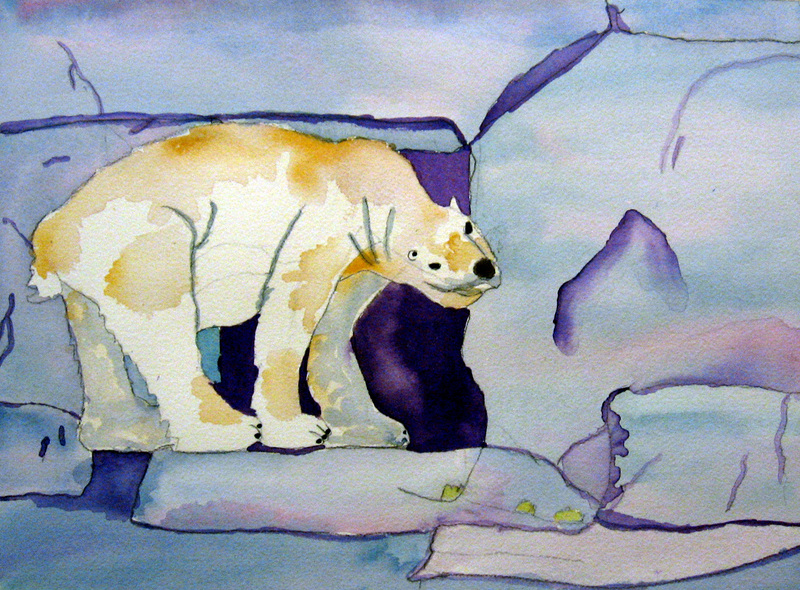 The drawing of the polar bear was totally unassisted! I cautioned them about rinsing their brushes before they went back into the palettes for their colors and that was all she wrote. They were off and painting! Insert, here, praise for their art teachers. The conversation around the table started to revolve around what their art teachers had taught them in school. One Granddaughter stating that her teacher taught her that a painting was just lines, shapes and then add color! Another said her teacher had told her to use bright color and another talked about her teacher teaching them to use the whole page. And they didn’t get bored! Thank you to all those Moms and Art Teachers out there who recognize the value of creativity for our children. They may never make a living creating art, but they are learning skills that will stick with them a lifetime about exploring, creating and making choices. Plus! They will have one more thing they can enjoy doing in their free time!